Anastasia Emelianoff Gilpatrick serves as the Project Manager for the Office of the Provost. In this role, she is the director of technical services and the director of faculty credentials. Anastasia received her B.A. in Political Science from College of Charleston in 2007 and Master of Public Policy (M.P.P.) from the University of Maryland in 2012. Prior to joining the College, Mrs. Gilpatrick served as a City Planner for the City of Charleston for four years and worked in the field of energy policy for a variety of organizations including the Brookings Institution and the EPA's Environmental Finance Center. Gilpatrick joined the Office of the Provost in 2014. She leads the Academic Affairs Division's technical projects, software solutions, and data management and integrity initiatives. Mrs. Gilpatrick handles escalations for several of the division's software systems including, Banner, BDM, Workflow, PeopleAdmin™, Blue® and Blue Portal Integrator, Cognos Reports, Faculty/Administrator Salary Database, SharePoint®, and Activity Insight™ Faculty Activity System. 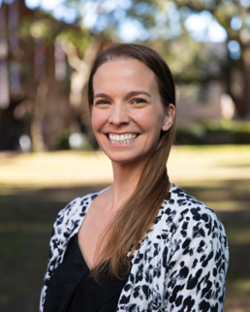 Anastasia also manages the College's faculty credentials to ensure compliance with CHE, SACSCOC, and CofC standards and coordinates the faculty credentials review process, appointment processing, and other related internal and external reporting. Mrs. Gilpatrick collaborates with others at the College to develop and implement best practices and new communication strategies in an effort to promote efficiency and clarity in our practices and procedures. She provides training on our divisions' technical services, faculty credentials, and other business processes, as needed. Anastasia oversees the coordination of events sponsored by the Office of the Provost. As the departmental webmaster, she designs and manages Academic Affairs' website, College publications, technical documentation, and other communication projects, as well as serving as the webmaster for the Center for the Global Alliance for South Carolina, the Center for the Study of Slavery in Charleston, and the College's Commencement website.